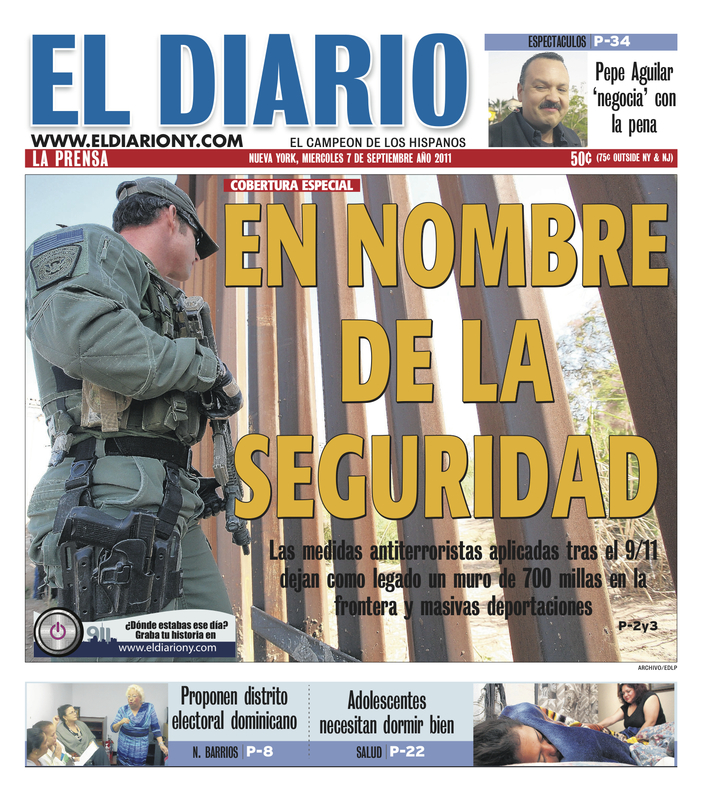 To download the Spanish-language version click here. The 2001 attacks carved a deep gash into Lower Manhattan, and scarred the minds of New Yorkers with memories of the collapsing Twin Towers that left 2,753 people dead. Ten years later, the nation can count two wars and a sprawling national security apparatus as a part of the legacy of that bright autumn day. 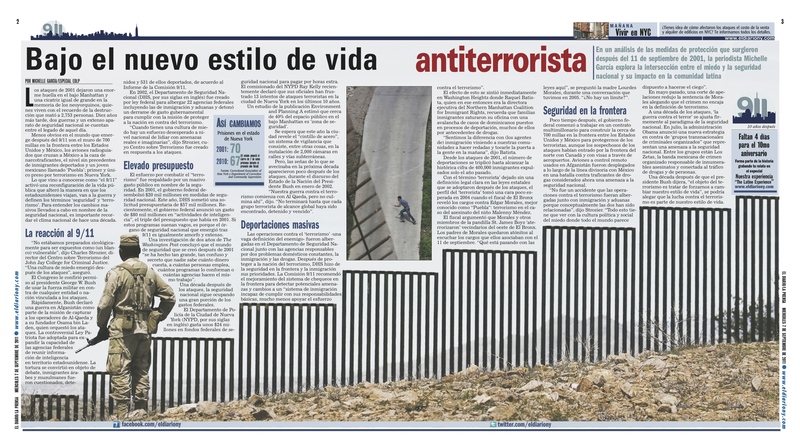 Less obvious in the calculus of the ‘post 9/11’ world that emerged is the 700-mile fence on the U.S.-Mexico border, the unmanned drones that cruise into Mexico on the hunt for drug traffickers, an unprecedented level of immigrant deportations and one baggy pant wearing baby-faced Mexican kid known as ‘Puebla’—New York state’s first and only convicted terrorist. Days later, the U.S. Congress granted President George W. Bush the power to use military force against any entity or nation tied to the attacks. Bush soon declared a war in Afghanistan as part of a mission to capture Al Qaeda operatives and its founder Osama bin Laden who orchestrated the attacks. The controversial PATRIOT Act was adopted which expanded the powers of federal agencies to gather intelligence within the nation’s borders. Torture became the subject of great debate, Arab and Muslim immigrant men were questioned, detained and 531 were eventually deported, according to the 9/11 Commission Report. The effort to combat ‘terrorism’ that ensued was backed by massive government spending in the name of security. In 2001, the federal government spent about $20 billion on homeland security measures. This year, DHS submitted a budget request of $57 billion. The federal government also recently announced some $80 billion in spending on ‘intelligence activities’ in one year, triple the budget in 2001. If these programs seem vague, it’s because the national security organ that emerged is as amorphous as it is far reaching. A decade after the attacks, national security remains a major portion of government spending with few signs of abating. The New York City Police Department plans to spend about $24 million in federal homeland security grants to pay for overtime. The NYPD budget lists an estimated $180 million in counter terrorism and intelligence spending for the upcoming year, with one half covered with federal grants. Police Commissioner Ray Kelly recently stated that law enforcement officials have thwarted 13 attempted terrorist plots in the city in the last decade. The attacks have left an indelible mark on New York City’s cityscape with metal gates and barriers seen throughout the city. A study by the academic journal Environment and Planning A estimated that nearly 40 percent of public space in downtown Manhattan is a ‘security zone.’ This year, the city will unveil the “ring of steel” modeled after London’s surveillance system and consisting of among other things, nearly 2,000 cameras installed in subways and streets. With the term terrorist left undefined in the state laws adopted after the attacks, the profile of a ‘terrorist’ turned up unexpected face in 2004 when the Bronx district attorney unsealed an indictment Edgar Morales, aka “Puebla,” on charges of terrorism in the killing of 10-year-old Malenny Mendez. Soon after, the federal government began work on a multi-billion dollar 700-mile fence on the U.S. Mexico border ostensibly to protect against terrorists, although suspected terrorists have entered through the northern border with Canada and with visas through airports. Drones used in Afghanistan have been deployed along the border and into Mexico in the fight against drug traffickers who have been deemed a threat to national security. A decade later the ‘war on terror’ fits firmly within the paradigm of national security. In July, the Obama Administration announced a new strategy against ‘transnational organized crime groups” that pose a threat to national security and threaten to destabilize nations. Among the four groups listed was the Zetas, a Mexican organized crime group responsible for countless killings and tied to the ongoing and lucrative human and drug smuggling trade. A decade after then President George W. Bush said, “the object of terrorism is to try to force us to change our way of life,” one might argue that the fight against terrorism was grafted onto our way of life. This entry was posted in Covering New York City, Reports, Violence/Conflicts. Bookmark the permalink.